Henk Wymeersch is Professor with the Communication Systems Group. He leads the area of Cooperative Systems and is affiliated with the FORCE research center on optical communication. 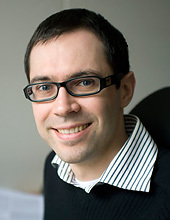 Henk is the author of Iterative Receiver Design and focuses his research on algorithm design for digital communication, localization and statistical inference. There might be more projects where Henk Wymeersch participates, but you have to be logged in as a Chalmers employee to see them.